As a rough estimate, I'd say that 80% of all photographs I see exhibited in galleries are digitally printed. Most of them look great, and I have no complaint about their general print quality. It is usually topnotch. However, I do have one pet peeve about digital printing, and it is the use of a black border around the image. In the age of darkroom printing, a black border around an image said something specific. When an image is enlarged through a filed out carrier, the space between the image and carrier exposes to black. So with darkroom prints, a black border signifies a fullframe print, no cropping. In the digital age this tie no longer exists. The image can be cropped or whole, manipulated into any size or aspect ratio. The border is applied afterward. Now I'm not here to preach "thou shalt not crop" or any such dictum. I'm just saying, there's something slightly phony about taking a technique that has a very specific meaning in a darkroom and applying it all over the place without regard to its original meaning. It reminds me a bit of how the words "natural" or "organic" are used to market food nowadays, often appropriated by items whose connection to nature is tenuous. One thing that has definitely been lost with digital black borders is their sense of authenticity. Digital borders are all the same: they are straight black lines. But in the darkroom, each camera and carrier leaves its own particular border. The print merges into the border not in a straight line but in bumps and hiccups, leaving an identity as specific as a bullet's ballistic markings. A photographer using the same camera over the course of many years can leave his/her fingerprint in the border of entire projects. If you look closely at Diane Arbus' 1972 Monograph, which I believe was the first published photobook to print fullframe bordered images, her Rollei leaves its fingerprint in all the work. In the bottom right corner of every print is a small zigzagging staircase left by the camera, left by HER. 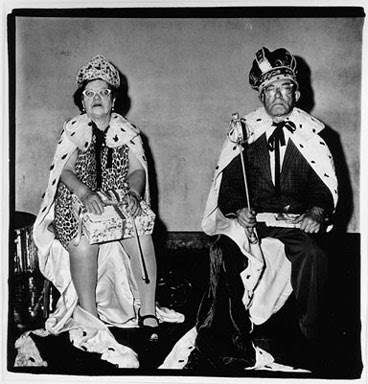 As a final experiment, go ahead and do a Google search for Arbus' images on the web. You'll see it is somewhat difficult to find anything by her online with the border/fingerprint intact. Most of her images online have been stripped of their distinct border. I suppose this isn't too surprising. I expect to see many of her images circulate in the future bordered by straight, black, digitally perfect lines. I border my digital prints with a (thin) black line for one reason only - to define the picture edges where pure white might otherwise render them indistinct. Surely I'm allowed to do that without people needing to make disparaging comments about lack of authenticity? Or maybe not, it seems. I thought HCB was the first to print black borders. I always thought it was a pretension anyway. I really don't care if an image is cropped. Photography is all about editing from selecting the scene to the final print to what gets published or shown. The final "edit" is what counts. There may be some people out there not old enough or knowledgable enough to know what the black border implies. To some extent, I agree with Nick. The black line does hold blown out highlights in. However, I don't agree that the comments were disparaging at all. In fact I found them interesting, one person's POV. For all of my years in the darkroom, I always had a filed out negative carrier and loved the way it defined the edges of the image against the paper. Sadly, years ago I had to give up the darkroom and switch to scanning. Fortunately, most scanners allow the edges of the frame to be scanned in naturally, so I still include it. Sometimes, in the heat of the moment on the street I shoot a bit askew and think about "fixing" it in photoshop and adding the border later. But then I think that the image being askew is what makes the moment what it is, not perfect, but authentic and spontaneous. My edges are never the same, always a bit different and always showing the true dimensions of the frame. For me, it's about being honest about what the frame is as I shot it. But then others take it too far with the over the top edging, some of which is available in software packages, in an effort to be "artsy". In the end it all comes down to what your intention is, to be honest or to get over. I'm not sure when HCB began printing with the border. His early books beginning with The Decisive Moment do not have it, but his later books (after Arbus?) do. Since I don't own any vintage HCB prints I can't tell which of his prints have it. I didn't mean my comments to disparage digital borders. But I do think that, even if the border is intended as a purely graphic device, it owes a historical debt to darkrooms. I doubt many digital printers would use it if darkroom printers had never pioneered fullframe printing. Well, it's also nice to see how organic film is in the sense that towards the borders the frames tend to 'break' in many ways. It's really obvious in those medium format shots, with small dents in and out of the frame. So different from a sensor. I remember peering through Arbus to compare all the borders of the pictures. I think she had a couple of cameras, as I had the impression that there were two or three different signatures in them. The one you have on the top is the most common by far. HCB prints were always stamped on the back DO NOT CROP! He would never allow any editor to crop his prints. I had HCB in mind when I said that I didn't mean to preach "do not crop", since he famously rejected any cropping. Interestingly, perhaps his best known image Behind the Gare St. Lazare, 1932, is cropped. If you do a google search for it, you'll see that most web versions have added a digital border. Anyway, writing "DO NOT CROP" on the back of a print seems a bit ineffective since presumably by that point the print has already been made. Since much more manipulation is possible with digital vs. darkroom processing the black line becomes a rather minor issue. Afterall is the image less authentic if fully printed without the black rim and would it be very difficult to digitally customize a black border? My personal level of comfort in interpreting an image is enhanced when " image not digitally altered "or " silver gelatin print" is stated. 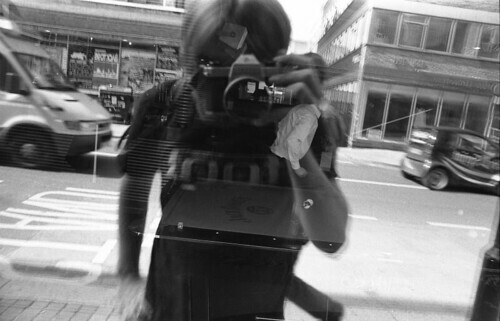 If not stated then I view the a digital image for what it appears to be... with a bit more skepticism whether what is presented actually occured. "Anyway, writing "DO NOT CROP" on the back of a print seems a bit ineffective since presumably by that point the print has already been made." The stamp was for prints sent for reproduction -- magazines generally didn't (don't) publish original prints, so there was a point. The equivalent now would be to list restrictions in the metadata.